"This is a great recipe when you don't want to wait for the dough to rise. You just mix it and allow it to rest for 5 minutes and then it's ready to go!! It yields a soft, chewy crust. For a real treat, I recommend you use bread flour and bake it on a pizza stone, but all-purpose flour works well too. Enjoy!" 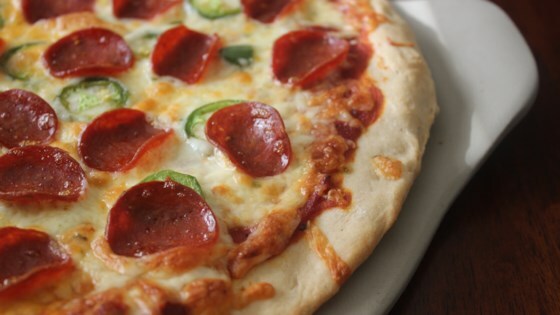 The best pizza crust recipe that I have ever made! When using jarred active dry yeast, 2-1/4 tsp. yeast = (.25 ounce) package active dry yeast. Delicious & Easy! I read previous reviews and also added Italian spices and onion powder. Also, let dough rise 1/2 hour. Great recipe. Will make again. This crust "makes" my pizza. I sprinkle a bit of parmesan cheese, and italian seasoning on the top before adding the pizza sauce. It's quick and simple and delicious!